Be the first to share your favorite memory, photo or story of Royce. This memorial page is dedicated for family, friends and future generations to celebrate the life of their loved one. 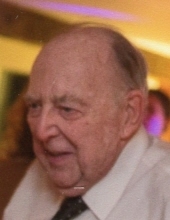 Royce Cornell, age 92, passed away on November 8, 2018 at Accura Healthcare of Ames. Private family services will be held at a later date at the Gilbert Cemetery. Royce A Cornell was born May 15, 1926 to Elvin and Agnes (Pomey) Cornell in Chicago, Illinois. Royce graduated from Fort Dodge High School and then served in the United States Army Air Corps from July of 1944 to 1946, where he attained the rank of Corporal. After his Honorable Discharge, Royce attended West Virginia State College, Northwestern University, the Freight Traffic Institute in Chicago, and the College of Advanced Traffic in Chicago. Royce and Marian "Mimi" Mathews were married June 20, 1948 in Ames. He was the owner and president of Cornell Shipping (CHGO) and was a member of the Chicago Piggyback Association and the Charleston, West Virginia Traffic Club, serving as president for both groups. Royce and Mimi moved back to Ames in 1982. Royce is survived by his daughter, Cathy (Gary) Smith of Woodbridge, VA.; his grandchildren, Leslie (Darryl) Lawton and Jennifer Smith (Jon Derby); and three great-grandchildren, Silvie Lawton, Cameron Lawton and Clementine Anne Derby. He was preceded in death by his wife Mimi September 27, 2018, and his parents. Adams Funeral Home in Ames is assisting the family with arrangements. Condolences and photos may be shared at www.adamssoderstrum.com. To send flowers or a remembrance gift to the family of Royce A. Cornell, please visit our Tribute Store. "Email Address" would like to share the life celebration of Royce A. Cornell. Click on the "link" to go to share a favorite memory or leave a condolence message for the family.